To be honest, most “monthly clubs” websites look a little bit like they were designed a decade ago, and Amazing Clubs was no different. However, the way they conduct business is very solid, and their cheese selections were delicious. Each shipment arrived as expected, and I enjoyed every bite of cheese. 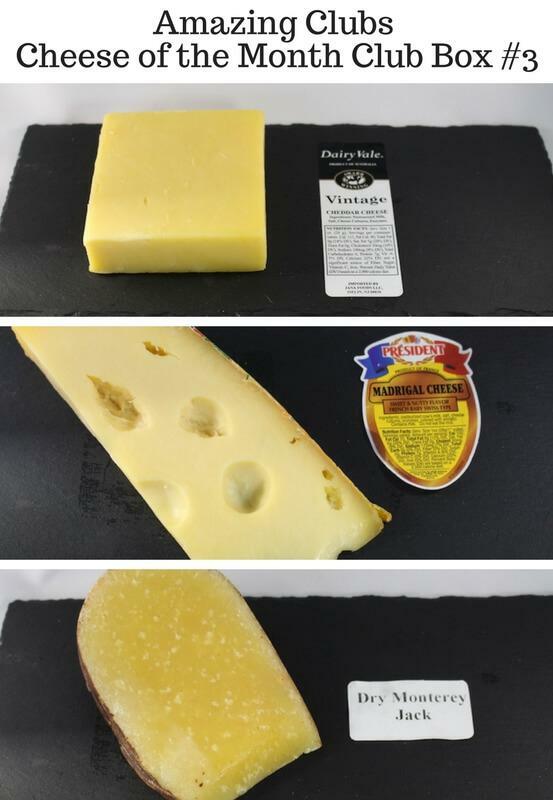 Here's what I got in my 3-month subscription, and what I thought of the individual cheeses. All three selections from my first package were Amazing. The aged gouda was very “snackable”. If I remember correctly, it was a blend of two types of cheeses, gouda and one other I can't remember. At first, I was a little put off by the appearance of the black pepper cheddar, but after reading that it was “cave aged”, suddenly the rind looked more appropriate, and I enjoyed the flavor a lot. The pepper was strong, but didn't overpower the cheddar. I really liked the idea of it being cave aged! The asiago stagionato was a lot more pungent, but still great cut up into small squares. I used some in a risotto as well since it had such a strong flavor. This cheese went great with my IPA beer club. The second delivery from Amazing Clubs had one amazing cheese, one okay cheese, and one I didn't really like that much. Can you guess which one? My favorite cheese form all three packages was included in box #2: the ibores. It was tangy, buttery, and almost like shortbread. Very fragrant! This one didn't last more than 2 days in the fridge. I couldn't stop eating it! However, I didn't like the sardo much. It was dry, crumbly, and not really pungent at all. I shredded this in a few meals to see if it tasted better as part of different food parings, but it didn't really do much for me. It wasn't horrible! I ate it all. but I wouldn't ever buy it for myself. At least now I know, and education is part of the fun part of these cheese of the month clubs. The rosemary cheese was certainly very interesting. I'm not so into “flavored” cheeses, but this was great with some crackers, and was a nice addition to spaghetti bolognese. Well, I guess I'm finding out that I don't like dry cheeses very much (except parmesan & asiago), because I didn't like the dry monterey jack very much. I found it to be much like the sardo, although a bit more oily. It was just kind of dry and crumbly. it didn't do well as a snack, and didn't add a whole lot of flavor to other foods. The vintage cheddar was tasty, but the madrigal cheese was a little bland. 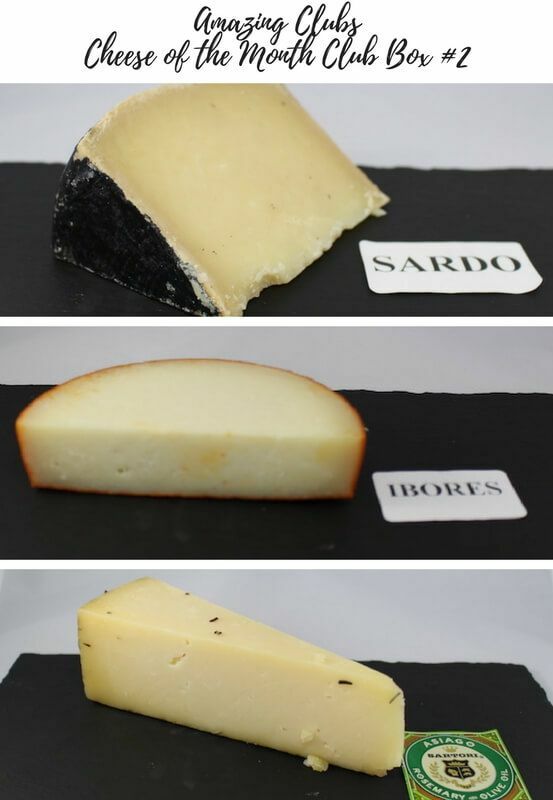 There are many types of cheese of the month clubs out there, some which include wine, while others may include other artisanal foods. 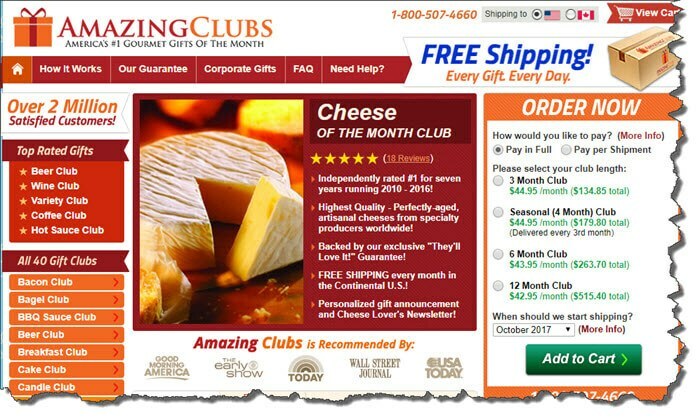 However, AmazingClubs.com goes a more “traditional” cheese club route, only sending 3 half-pound pieces of cheese each month…and that's not a bad thing! Honestly, I joined these cheese clubs because I like cheese, not because I want a bunch of expensive crackers (though the salami and charcuterie were delicious, and I may consider joining a charcuterie of the month club in the future). Personally, I love pairing hoppy beer with strong cheeses because the powerful flavors contrast each other. The dry, hop-forward beers cut through the flavors of the pungent cheese as I ready for round two. Anyway, that's just me. The point is that I like to just get my cheese and go from there. No need to send me a bunch of other stuff. Long term, it's cheaper too. I can buy my own snacks and drinks to pair with! After personally testing 5 different cheese of the month clubs, I can confidently say that Amazing Clubs offers great-tasting cheese deliveries at a reasonable price. They rank somewhere in the middle in my opinion. Many other cheese clubs come with stuff like wine pairings or charcuterie which I'm not that interested in. As far as cheese-only clubs, Amazing clubs does a great job of selecting a large variety for the cheese enthusiast. However, in my 3-month membership, I enjoyed the cheese selection from MonthlyClubs.com better. This could be just due to personal taste, but I found the cheeses to have better flavor, and more “snackable”, meaning I could just cut them up and eat them with crackers and beer. I also thought their cheeses had stronger flavors, and I love my pungent cheeses! I also saw that two selections in Amazing Clubs came prepackaged, so it looked like they just bought them at SaveMart. I like the wax packaging better because it looks like it comes from a fancy cheese wheel. 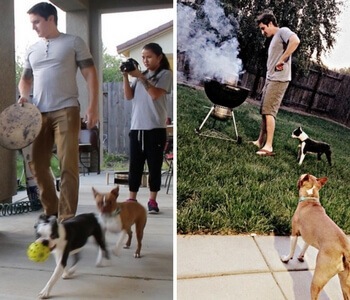 Monthly Clubs offers a 2-month minimum membership, while Amazing Clubs only offers a 3-month. Monthly Clubs also includes a more extensive information resources about the cheese. 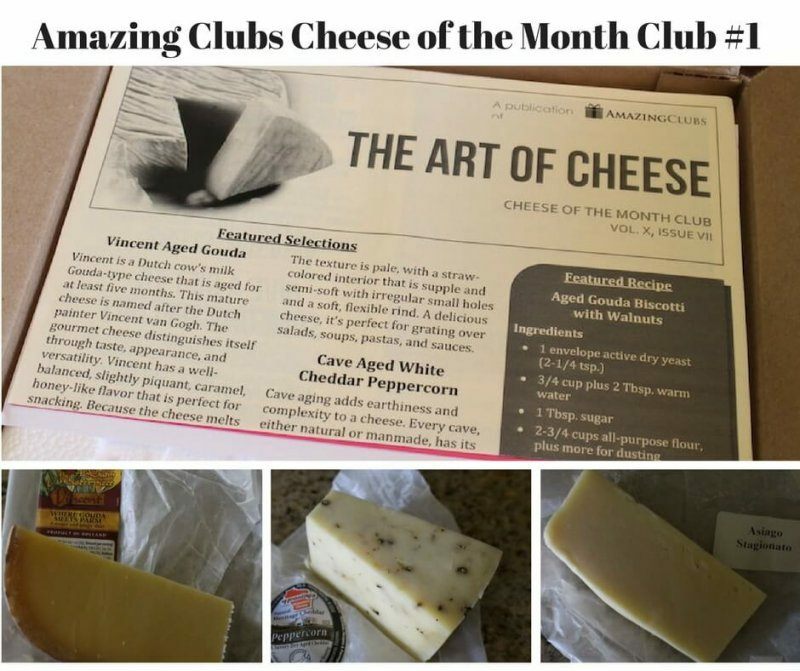 Who is the Amazing Clubs Cheese of the Month Club Best For? If you love cheese, or know someone that does, Amazing Clubs is a great club to join to receive monthly shipments of artisan cheeses to your door. Even though I liked Monthly Clubs Gourmet Cheese Club better, Amazing Clubs is also a good club. Honestly, it could be just the particular selection for those three months I was a member. Both clubs are similarly priced, and do not focus on a specific type of cheese (other than it being delicious!). There are a few minor differences between the clubs that made me choose the club as my “favorite”. Still, you may like the look of the Amazing Clubs website better, or know someone that joined and was happy. If that's the case, it's still a good club to join!